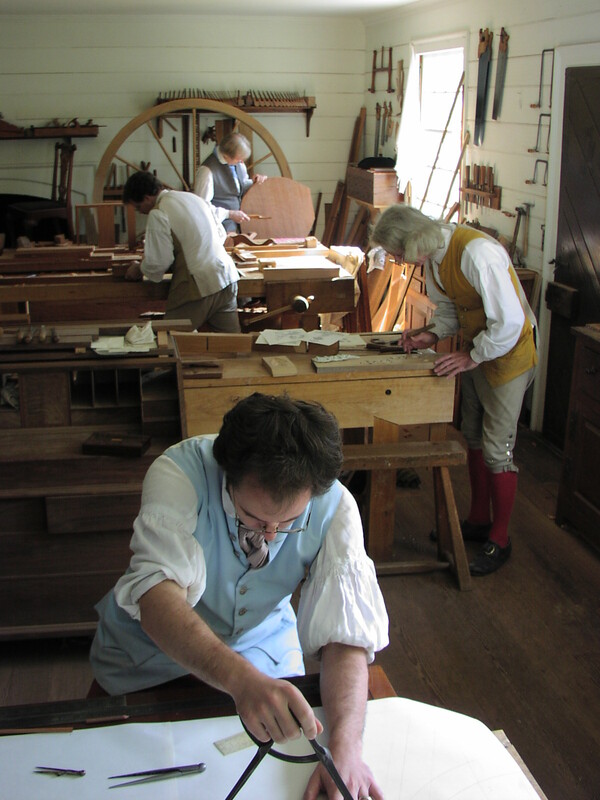 The Anthony Hay Shop at Colonial Williamsburg is dedicated to the exploration and execution of the cabinetmaker’s trade as practiced in late colonial Virginia. To this end, we employ only the tools, techniques, and materials (when possible) available to our 18th century counterparts. Following in the footsteps of the historical shop, we also explore the trades of carving and harpsichord making. Hay’s shop on Nicholson Street in Williamsburg produced fine furniture for Virginia’s gentry and “upper-middling” classes from 1750/51 – 1776. Today’s shop produces furniture for Colonial Williamsburg, teaches visitors about our craft and its history, and hosts an anual symposium: Working Wood in the 18th Century. Great. I am so glad you have started this blog. I have always enjoyed a peace and tranquility when visiting CW and especially the Anthony Hay shop. Look forward to future posts and can only hope that you post some dimension and plans for pieces you are making. maybe you could start with the Wentworth chair? I like to see that some things are still made the old way ,I also wish I lived closer so as I could vist.My father biult 18th century furnisher he made my mom a whole house ful of chest and blockfront chest and tables.Some of that work had to be done by hand. I think that working by hand makes one a better woodworker.I have decovered hand planes and love useing them. Keep up the great work I am looking forward to more of your blogs. I look forward to your future posts. Great start and thanks for sharing. I look forward to reading more… this is very cool. I am really enjoying the blog. Thank you! I do have one small request. I follow your site through my RSS reader and your RSS feed is set to display excerpts only. As a result, I can’t read the full article and I can’t share the article with my readers. If possible, could you guys set the RSS feeds to “full text”? The setting is under Settings>Reading (in case you weren’t aware). Thanks very much for sharing your woodworking with the world! Whoops! Scratch that comment. Just realized the browser feed is showing excerpts but the true feed is showing full posts. As you were, haha. What a wonderful blog! !, I work at The Art Institute of Chicago (museum) and am currently researching how furniture was made in 18th century Europe including woodwork, wood inlay/marquetry, joinery, and penwork. I’d be curious to know if the tools, artistic techniques, and process steps were identical to that in 18th century colonial secretary desk and chair design. Yes, we use the historical tools and methods of that time and faithfully reproduce designs based on original furniture. Many traditional woodworking practices have continued to our time, so it’s not like we have to resurrect a whole tradition completely from scratch. But the practice then was different from now. We have to rely on study of original furniture and tools for much of our evidence about processes, since very few technical writings on woodworking (and cabinetmaking in particular) were written in England (and nothing at all on building spinet harpsichords) during the 18th century. The French and Germans, on the other hand, write whole volumes on process and technology (see the Sprengel translations on this blog site), but that does not help us much with the English way of doing things and the English way was our way in the Williamsburg area of Virginia. So we do our best to follow through on historical processes as much as available evidence from all sources allows us. A great blog indeed!! Added to the feed aggregator on my site. Thanks. Great to hear that you are still involved in music. We were at UNC-G together. I am looking for someone to build a 19th Century Terz Guitar for me. I realize this is a little outside your current area, but could you offer any suggestions? Thanks. no comment, only a question. from whom does the shop purchase its seedlac. for many years i used woodworkers supply, but no more. Ed, there are a number of sources for seedlac and related finishes. Two that we have used in the more recent past are The Olde Mill Cabinet Shoppe and schallac.net. I hope that helps!